South African Champion Schonhardt I Own The Zoo (imp Aust) was sent to Dani Pera in South Africa and soon became the top male mini in Rhodesia there. "Boss" is my first South African champion and was sired by Canadian/Australian Champion All My Rowdy Friends (imp Canada) who was bred by Miss Kate McMillan. Boss will soon be joined by another male for Dani and Pat to campaign. Dani is a seasoned exhibitor and Pat an All Breeds Judge. 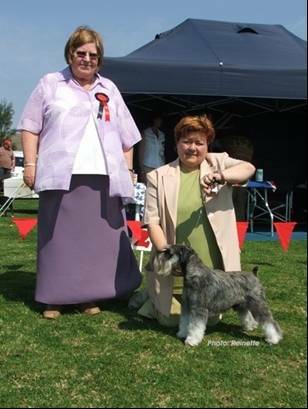 Dani being involved with Airedales for some years and one of which was the top Terrier in 2006 and 2007. See photo of Pat de Conning and Boss above.